You can spend days looking for fish finders online and still not find useful enough, practical information to actually make a sound decision and buy one. It’s probably because people who buy one are too busy spending their days on a lake, mapping the depths and the fish schools, to waste their time writing a review. Considering the special characteristics of a pontoon boat, you can’t just buy any fish finder. There aren’t any specific models for pontoons either, but you do have to take into account a couple of details which make the fish finder suitable for your pontoon boat. As such, we’ve come up with a list of things that can help you choose the most appropriate fish finder among the many options you have. As far as we’re concerned, this is a match between two giants: Lowrance and Humminbird. There are, of course, other brands as well, such as Garmin and Deeper Pro, and they have some fairly good reviews. However, we’d rather go with what’s well-established and reputable in the world of fishing. After all, if you’re going to pay a couple hundred anyway, you might as well go the extra mile and get something of unquestionable quality. Lowrance vs. Humminbird, in practical terms, is pretty much the fish finder version of the Android vs. iPhone battle. Lowrance is the Android of fish finders: you can meddle with the settings as much as you like, it has a whole boatload of options, and they’re great for networking. This is particularly important when you want to add multiple screens to your fish finder, which can be of great aid if you have a big pontoon boat. On the other hand, Lowrance models are quite susceptible to bugs and the likes and if you fiddle with the settings too much, you may very well not know how to switch it back to normal. What’s more, the processors they use are often underpowered, with all the subsequent disadvantages. Out of all their models, we’d recommend the Lowrance ELITE-4 HDI Combo Plotter/Fishfinder. On the other hand, the best point of Humminbird finders is that they work. They’re not designed to do many special things, like the Lowrance models, nor are they particularly suitable for networking, and you definitely cannot customize them all that much. However, they have excellent processing power and even with one or two SD cards inserted (yes, the Humminbird 859 DI does offer two slots) they work without a problem. Kind of like iPhones: they’re simple, easy to use, and reliable. 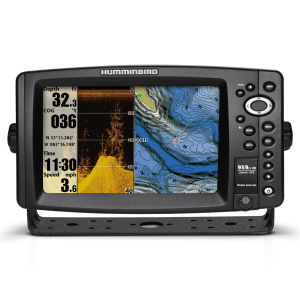 Out of all their models, we’d recommend the Humminbird 410210-1 HELIX 5 CHIRP GPS G2. From this point of view, you do get what you pay for with both of these options. In the Lowrance case, you pay one or two hundred more for all the things a Humminbird doesn’t have and we described above. In the Humminbird case, you pay a bit less for something that, in short, works. As we gathered from the reviews on Amazon and other retail websites, Humminbird is apparently a better deal. However, it’s really all up to your preference. A most common item that pontoon captains pair with a fish finder is a trolling motor. For our recommendations regarding trolling motors, please read the respective article. In short, there are two main competitors on the trolling motor market: Motor Guide and Minn Kota, with the Xi5 and Terrova models, respectively. Lowrance finders are compatible with the Motor Guide models and will work perfectly with the popular Xi5. On the other hand, Humminbird finders do their magic best with Minn Kota motors and work best with models like Terrova, Ulterra, and PowerDrive V2. As such, if you already have a trolling motor, check its compatibility before purchasing a finder. If not, think anyway about what motor you’d buy if you’d buy one and take that into account as well. A pontoon boat will always have a larger deck than a traditional boat for the same length. As such, you will need better visibility from different parts of the boat when fishing. For instance, if you’re fishing for bass, walleye, panfish, and the likes, you will probably need more than one screen. As you spend more time anchored in specific areas rather than going around trolling, you will most likely go around the boat a lot more and you’ll want to see what’s happening from every possible place you could be on the deck. By contrast, if you’re fishing for trout, salmon, or other fishes that like to move a lot, you’ll probably spend more time dragging the bait along the water, which will not leave you so much time to move around the deck. Consequently, you only need to see the screen well from the back of the deck and, as such, you’ll need one big screen rather than many small ones. As said above, if you need to see the screen well from a greater distance, it’s better to get a bigger screen. 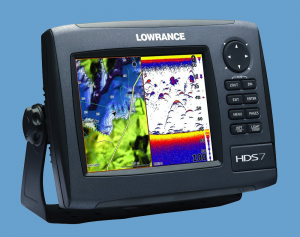 For instance, the Humminbird 409820-1 offers a 7” screen which you can see clearly from the back of a 22’ boat. What’s more, although the resolution is only 800 x 480, the image is clear enough for all practical purposes and, even better, the anti-glare is amazing – you can see everything clearly even when the sun is shining brightly. The problem is, what if your screen doesn’t fit on the dashboard? You have to mount your screen on the console without it covering any of the gauges or blocking visibility and many consoles just won’t let you install something bigger than 5”. At any rate, we also have an article about how to mount your fish finder, which we believe you’d find very useful at this point. The general tendency for pontoon boat owners is to mount the transducer on one of the pontoons’ rear bracket, on the captain’s console side (usually starboard). This is perfect if you’re trolling a lot, but it might prove a problem for bass fishermen, for instance, who spend a lot of time standing at the front of the boat. If the transducer is some 18-26’ away from you, depending on the size of your boat, this may cause lots of issues, especially when fishing for one specific fish. As such, you may need a side imaging fish finder, or even two fish finders in order to get accurate readings on both ends of the boat. If you have a trolling motor ALWAYS check if the fishfinder if you’re looking at is compatible with the motor! I mean it is possible to use the finder if it’s not compatible but it will be quite the hassle, and the results won’t be as accurate as you expect, especially when you spend $300+ on the fishfinder alone. Very good recommendations, thank you very much, I’m thinking of getting a fish finder for my husband’s 60th birthday this year but had no idea what to liik for. Think I’ll go with a Hummingbird one.